Boston 1775: Book Talk at the Massachusetts State Library, 29 Nov.
Book Talk at the Massachusetts State Library, 29 Nov.
I’m pleased to report that The Road to Concord: How Four Stolen Cannon Ignited the Revolutionary War is now available in digital form for both the Kindle and Nook readers, as well as through iBooks. I suppose that as a modern author I should add a plea to people who have enjoyed the book to post reviews of it at those online retailers or others, or at Goodreads. But I’m very slow at rating and reviewing products at such sites myself. So all I can say is that if you’re already in the habit of posting book reviews on a website you like, please consider addressing The Road to Concord as well. Thanks! On Tuesday, 29 November, I’ll speak at the State Library of Massachusetts inside the new State House. (The one with the dome, not the one with the lion and unicorn.) That’s a lunchtime talk, noon to 1:00 P.M., on Beacon Hill, and I’ll sign books afterward. Published earlier this year, The Road to Concord explores the confrontations in New England that led up to the Revolutionary War. It starts with the action-packed days of September 1774, when a spontaneous rural uprising overthrew the royal government of Massachusetts outside of Boston. In the following months, the colony’s Patriots worked to build up a military force. Meanwhile, the British military, under the leadership of General Thomas Gage, tried to thwart those efforts. 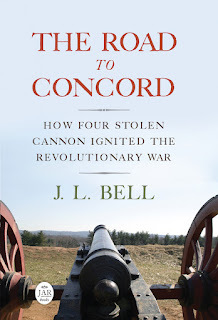 Central to this story are four small brass cannon belonging to the colonial militia that were smuggled out of Boston by radical Patriots and subsequently located by British spies on a farm in Concord. For different reasons, both the Patriots and Gage strove to keep these guns out of their public reports. In his thoroughly documented book, Mr. Bell argues that these little-known episodes sparked the beginning of the Revolutionary War. This talk will focus on the “Powder Alarm” that opens the book and sets off New England’s “arms race.” I’ll look forward to seeing folks on Tuesday in Room 341 of the Massachusetts State House. How soon will the paperback be available? There's no schedule for a paperback yet.